So, I wrote another flash fiction, this one 1,000 words. Also not romance. It’s all Chuck Wendig‘s fault. Rubber-soled shoes squeaked outside of my room and I stuffed the knife under my pillow, flopping backward and letting my mouth hang open slightly. I focused on my breathing—in and out, slowly, carefully—as the door opened. From somewhere down the hall came a pitiable moan. There was a pause—in, out, slowly, carefully, breathe Dorothy—and then the hated reek reek reek of the rubber-soled shoes moved purposely toward my bed. The sweet sounding words came with a pinch to the sensitive skin on the inside of my upper arm, swift and vicious as a wasp sting. I had already schooled myself not to flinch and, instead, allowed a thin trickle of drool to leak from the corner of my mouth. A snort of disgust, and hard fingers gripped my chin to wrench my jaw further open. A pill was shoved roughly under my tongue. The shoes squeaked their way back from where they’d come. I counted to one hundred, then lifted my head and turned, spitting the pill toward the wall, the same as I’d done the last six nights, tasting bitterness on my tongue. I counted to five hundred after the last bed check, and then tossed back the thin sheet that covered my wasted legs. Sitting up, I ignoring the twinge of unused back muscles, and continued to saw at the bindings on my ankles with the butter knife I’d stolen from my dinner plate two nights ago. The right one had frayed to threads and gave way after only a few moments. The left had quite a bit further to go. I had to get out of here tonight. Tomorrow was Sunday. Bath day. And, thinking I’d been in a drugged sleep, Nurse Rebecca had sighed sympathetically about it being my last bath, but assured me I’d go at least go into my casket clean. A bead of sweat trickled down the side of my cheek, but I didn’t stop to wipe it away. My hands cramped painfully, but I didn’t stop to shake the knots out. The sheets were damp beneath my ankle from where the bindings had chafed them bloody, and twice, where the knife had slipped. Morning bed checks started at 6:00 AM. I couldn’t stop. The last thread of binding came away with almost an audible snap. For a moment, I just stared in the darkness. I had done it. It was nearly harder to swing my legs over the side of the hospital bed than it had been to get this far. Not only because of my weakened physical condition—I thought longingly of my tennis pro days—but because this was it. This was the extent of my escape plan. Cutting loose. What came next, I had no idea. I gingerly lowered myself to the floor, the linoleum cold on the soles of my feet. My legs wobbled wildly under me. Not surprising, since I hadn’t used them in months. After a few shaky steps, though, adrenaline kicked in, a little strength flooding into my limbs. One step at a time. 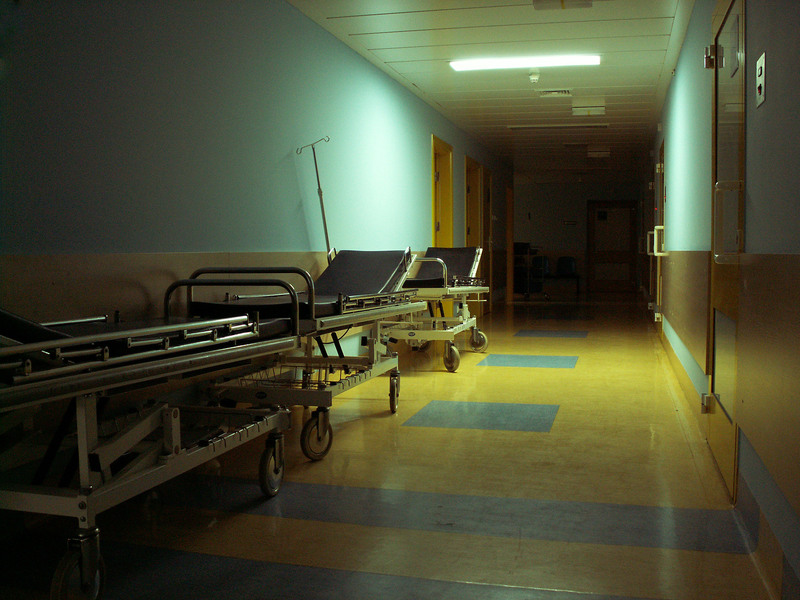 The corridor was dim, the overhead lights turned down for the night shift nurses, most of whom slept at their desks, I’d heard the daytime staff complain. There was no sound, except the faint beeping of machines behind closed doors, and I inched my way down the hall, one hand on the wall for balance. The sharp sting of bleach hung heavy in the air. The nurse’s station was dark, but I made out a slunched-over figure, soft snores coming from it. I eased past, close enough to smell the sleeping nurse’s perfume, floral and cloying like roses drowning in antiseptic. The near-silence was shattered by the harsh shrill of an alarm. I stood frozen against the wall, willing the nurse not to see me. She shoved heavily to her feet and shuffled the opposite direction. An exit sign glowed invitingly, just a few more feet away. My door, I remembered abruptly. Had I closed it behind me? If the night nurse saw that, I’d be caught. Moving more quickly than I had so far, I went around the back of the desk, feeling under the counter with shaking fingers until I found a button. Holding my breath, I pushed it. The exit door buzzed as the locking mechanism released, but was muffled by the patient alarm, still sounding. Now, to get to the door before it latched again. I lurched for it, my legs stiff, muscles protesting. The patient alarm went silent. The metal handle felt cold under my hand and my heart leapt as it pulled open easily. One more set of doors and I was in the nearly-empty parking lot, a fresh, light breeze touching my cheeks and teasing at my hair. Black sky was just beginning to edge with pink toward the east. But along with the sleepy twitters of a few early birds, I heard the faint growl of a car engine. Cursing my painfully slow limbs, I hobbled over harsh gravel toward the wooded area at the end of the parking lot. But I was illuminated in the headlights of a car before I made it fifteen feet. With a feeling of inevitability, I turned and waited, unflinching, as a dark little BMW rocked to a stop less than a foot from me. The door opened and Nurse Rebecca stepped out. She was smiling, the yellowish parking lot lights glinting off of her rich blond hair and dancing over her dangling silver earrings. Correction. My silver earrings. I recognized the elaborate twists as the same ones Jack had bought me in Barbados for our 45th wedding anniversary. I am LOVING this FF streak you’ve got going on. I was on the edge of my seat the whole time. Have you secretly been reading Mr. King? Very horrifying. I can totally hope another car rear ends her . . . I left it there, because I was at my word count and all (~1000) but Dorothy totally got her revenge in my head. 🙂 Thanks for reading! This is one of those stories that I wish I could see through to the very end. Hopefully, in the end, those evil people would get their comeuppance. Nice work. Well gee, that was only slightly traumatizing. I couldn’t wait to see if she made it! Really great, loved the way you had it suspenseful from the start. Are you sure you’re not a horror writer? Great Fun!